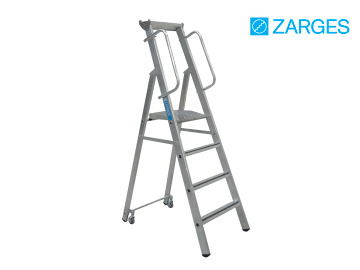 The Zarges Mobile Masterstep is safe and comfortable for optimum freedom of movement. 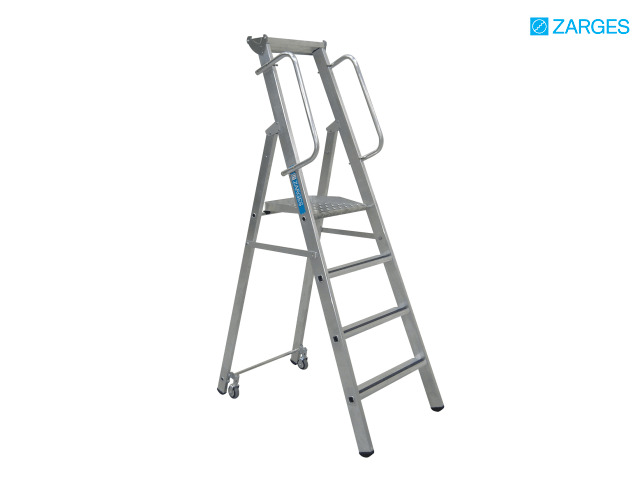 It has a large work platform (400mm x 400mm) with aluminium checker plate surface and 80mm deep steps with ZARGES Safer Step Technology for fatigue-free standing. Two handrails are supplied as standard for safe access. The ladder has an extra wide base which provides additional stability, and two high-strength Perlon straps for preventing splay. Its treads and stiles are made from extruded aluminium sections, and have high strength ZARGES quality flanged connections. In addition, two side locking bars prevent the step collapsing in use / during movement. Includes practical aluminium storage tray for small items and tools and spring loaded castors for ease of movement. They conform to EN 131 standards, and have a 150 Kilo rating. Stile depth steps / back stay: 73 / 58 mm.